Gueuze. It's magical. What is it you ask? Well, it all starts with a Lambic (an oak ripend spontaneously fermented ale). A one year old Lambic is blended with an older Lambic and -- MAGIC -- a second spontaneous fermentation happens in the bottle, creating the Gueuze. Review: A cloudy gold-amber color. Aromas of funk, barnyard, dried apricots, lemon rind. Dry, bright acid, tons of apricot, quince, lemon grass -- all set on a backdrop of farmy funky flavors. Bottom Line: Bright and farmy. I love it. The Ménage à Trois Red is one of the best selling wines in America. Ever wonder why? Three words: smooth, easy, sweet. Review: This wine is a bright, ruby red color. It has aromas of cherry preserves and sweet plums. The palate is a bit on the sweet side, with a surprisingly fresh acidity. The texture is mid-weight and smooth, with a low level of tannin that helps to keep the wine hyper quaffable. The flavors are a bit one note (not three, tee he he) of ripe simple red fruit. The finish is short and to the point. The wine is made of three grapes: Zinfandel, Cabernet Sauvignon, and Merlot. I didn't pick up on any barrel notes in the wine, so I think it's safe to assume that it is fermented and briefly aged in stainless steel or concrete. Food Pairing: Serve slightly chilled with simple fare. Or in a red solo cup at a party. Bottom Line: There isn't too much to say. The Ménage à Trois is simple and easy. Not my personal style, but I understand why it is so popular! Happy Sauvignon Blanc Day! In honor of this glorious holiday I had to open a classic California Sauv Blanc. Charles Krug is a winery of historic proportions in Napa Valley. Founded in the late 1800's, the winery has been in the hands of the Mondavi family since 1943. It's now run by Peter Mondavi Sr. and his sons (not to be confused with Robert Mondavi Winery). Review: This wine is a pale lemon-green color with pronounced aromas of green plum, gooseberry, lime zest, and passion fruit. It's dry with zesty acidity, tons of green fruit, steely minerals, and just a bit of grassiness. I'm typically not a fan of new world Sauvignon Blanc, but this is a lovely wine. The herbal notes weren't overwhelming, it was nicely ripe and refreshing. A very well made, showing excellent typicity. Food Pairing: Grilled fish with an herb salad. Bottom Line: Crisp and easy drinking with bright fruit. I dig it. Happy Earth Day! In honor of this day, I had to open a wine from Kendall-Jackson, one of the biggest names in domestic sustainability. Kendall-Jackson has a wide range of products, all made with water conservation, integrated pest management, and green energy at the forefront. The Vintner's Reserve Chardonnay is perhaps Kendall-Jackson's best known wine. As crazy as it may be, I'd actually never had it until tonight! Review: This Chardonnay is a rich gold color with pronounced aromas tropical pineapple, ripe apricot, and toasted oak. The palate is dry with a soft, mouthfilling texture. The flavors are dominated by oak notes: cedar, butterscotch, and charred wood. There's a bit of tropical and citrus fruit on the palate, but this wine is all about the oak. The finish is a bit on the short side. Food Pairing: So, it was a long night and I didn't have time to cook after getting home from work. I actually paired this with some chicken nuggets. Bottom Line: Admittedly, this is not a style of Chardonnay I gravitate towards (too much oak for me, a bit like gnawing on a fence post). That being said, I adore the texture of this wine -- so soft and generous. While it's not for me, I can understand why this wine is consistently a top seller! Last fall I had the pleasure of spending a few hours with winemaker Heidi Schröck (possibly the nicest and classiest lady I've ever met!) when I was in Rust, Austria. While Rust, on the banks of Lake Neusiedl, may be best known for noble sweet wines (where the grapes have been infected by noble rot), it is also the source of some amazing conventional wines, too! I recently came across this bottle of dry Muscat at a local store and simply had to take it home with me. This wine is a an interesting blend: 40% Gelber Muskateller (also known Muscat Blanc à Petits Grains, to noblest of the Muscat family), 20% Muscat Ottonel (the least aromatic of the Muscat family), and 40% Sauvignon Blanc. Review: This wine is a beautiful lemon-green color, with soft aromas of dried apricots, hay and slate. It's bone dry on the palate, with a moderate body. There's more dried stone fruits, a touch of pineapple, and a hint of bitter herb. The bottle age is apparent in the persistent notes of smoke and dried grass. The finish is medium in length. I wasn't sure what to expect given the 2007 vintage. This wine is almost eight years old, and nearing the end of its drinking window, but it is still displaying a beautiful character. I just adore the bottle-age notes and subtle herbs. Food Pairing: Herbed roast chicken with a parsnip puree to dial in some of the earthiness and light herbaceousness in the Muscat! Bottom Line: A delightful, light wine. Finally, my post on the fourth in the Game of Thrones series by Ommegang (you can find my thoughts on the Iron Throne, Take the Black, and Fire and Blood). I've been holding it since October, waiting for Season 5 to start, and the day is now upon us! 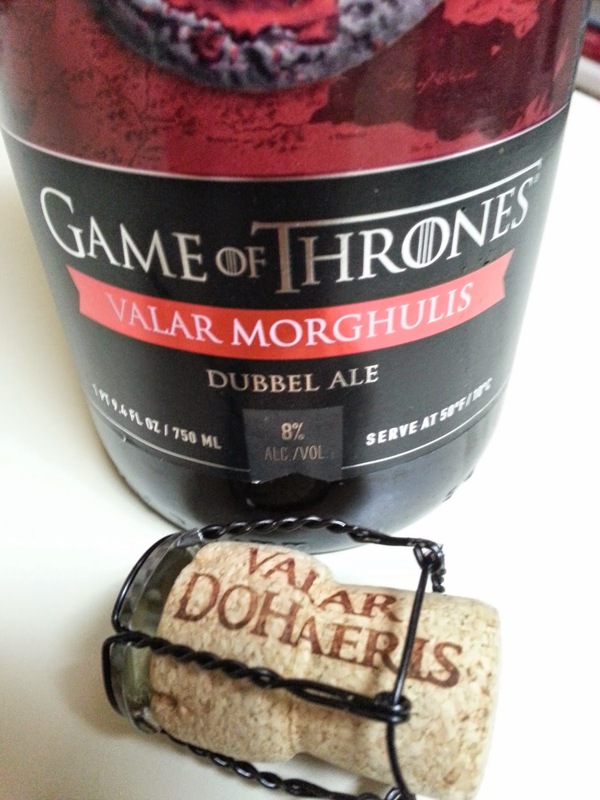 "Valar Morghulis" translates to “All Men Must Die" -- but this ale is one to live for. Delicious! A cute nerdtastic touch: the corks all say "Valar Dohaeris" (translates to "All Men Must Serve"), which of course is the High Valyrian response to Valar Morghulis. Review: This beer is a golden amber color, with a lacy foam head. It has strong aromas of toffee, torched sugar, and candied orange. The palate shows a slight sweetness, echoing the toffee and caramel notes on the nose, but finishing dry. I adore the texture: soft, supple, mouthfilling. So tasty. Bottom Line: By far, my favorite so far of the GOT series. I've got the newly released Three Eyed Raven Saison queued up for next week! Stay tuned! Last summer I had the pleasure of drinking the Decero Remolinos Malbec last summer, and the Cabernet definitely lived up to my high expectations. Review: This deeply pigmented Cab has aromas of black currant jam and ripe plums. On the palate it is dry with ripe, chalky tannin. The barrel notes come out on the palate, adding a bit of toast, vanilla, and sweet spices to the rich fruit character of the wine. Much like the Malbec, this Cabernet has slightly elevated alcohol for my taste; putting aside this balance issue, I'm very pleased by the wine. It has integrated tannin, concentrated fruit, and a lovely finish. Food Pairing: I paired this with a nice hearty meatloaf, full of sweet sun-dried tomatoes. The slight sweetness in the meatloaf was perfect to highlight the ripe fruit of the wine. Bottom Line: An enjoyable, easy Cabernet. It finally feels like spring, and nothing says spring to me like Vinho Verde! Review: The wine has a pale lemon color with aromas of ripe green melon, white flowers, and fresh lemon. On the palate, the wine presents as slightly off dry, with more ripe honeydew melon, sweet lemon drops, and a hint of minerality. The texture is soft and generous, but I find myself searching for more a bit more acidity and brightness. Food Pairing: Very versatile -- was great with southwest braised chicken thighs! Bottom Line: Overall a flavorful bottle. I wish it was a bit more acidic and lively, but pretty solid for $7.99.